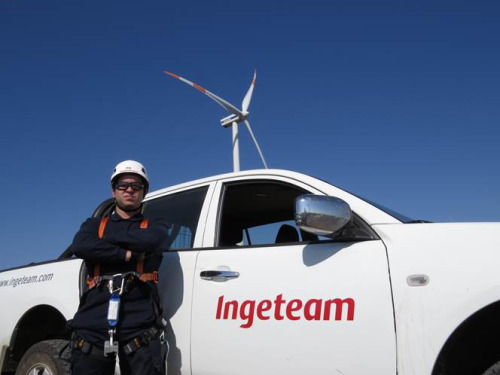 Ingeteam is the first independent services company to undertake the comprehensive maintenance of a wind farm in Chile (Image courtesy of Ingeteam). Ingeteam will now be responsible for full service operation and management of a Chilean wind farm following an agreement made with E-CL. For the first time in the country, these services are to be provided by an independent company through full-service maintenance at the Monte Redondo Wind Farm, located in the region of Coquimbo in northern Chile. This project aims to make it possible to develop and upgrade the NCRE (Non Conventional Renewable Energies) in Chile. It is to be directed by the Spanish multi-national Ingeteam, a global leader in the provision of operation & maintenance services and responsible for the services in 25% of the total installed power in Chile. The provision of this Full-Service contract is the outcome of an agreement signed with E-CL, the company owning the Monte Redondo Wind Farm and the leading electricity producer in northern Chile. The Monte Redondo wind farm comprises twenty-four VESTAS® V90 2MW wind turbines, which were installed in 2 stages. The first stage was completed in 2010, and the second stage just a year later. Now that the warranty period established by the manufacturer has ended, Ingeteam has won the contract for the provision of comprehensive maintenance services to the entire wind farm, becoming the first independent services company to undertake the comprehensive maintenance of a wind farm in Chile.